With nothing but the clothes on his back and less than $300 in his pocket, Amer Adi was put on a plane and deported to Jordan, the country he left 39 years ago to pursue his American dream. His 94-year-old mother sat in a wheelchair at the arrivals gate, overcome with emotion as she waited for Adi. She hadn't seen him in 20 years. Adi fell to his knees, a broken man in his mother's arms. "I have mixed feelings, very mixed feelings. I'm so happy, so glad to be here, my home, to see my mother, my brother, my family, my friends, that makes me proud and happy," Adi told CNN at the airport. 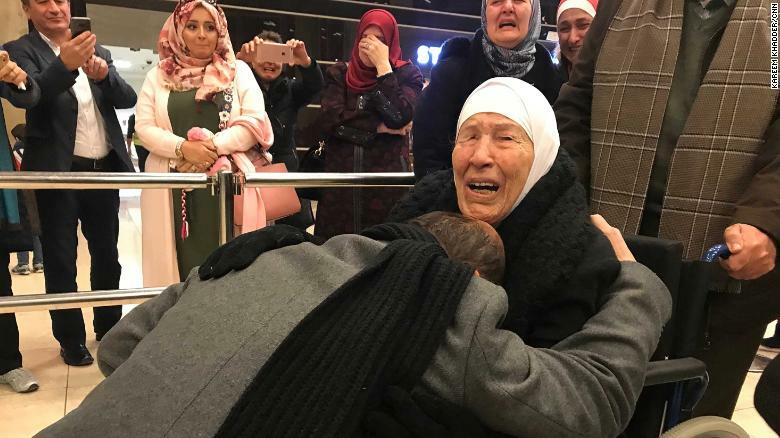 Amer Adi falls to his knees as he reunites with his mother for the first time in 20 years. "At the same time, I feel so sad of what happened to me. I'm so sorry to tell you what happened is unjust, not right, and everyone back there knows that. What the Trump administration is doing is -- you can't even explain it," said Adi. Immigration arrests have increased by 42% since Trump took office, according to the Department of Homeland Security's Immigration and Customs Enforcement (ICE). In the 1980s, Adi held a green card. But he lost his permanent resident status in the early 1990s, after moving to Brazil for three years with his wife. When he returned, Adi tried to apply for a new card, but was rejected. Immigration officials accused him of having a sham marriage with his American ex-wife. His ex-wife had signed a statement alleging marriage fraud. According to Adi, his lawyer and multiple media interviews with Adi's ex-wife, she was coerced into making the statement after immigration officials showed up at her door. In 2007, she signed an affidavit retracting her statement and denying the marriage was fraudulent. Despite the affidavit, he was unable to gain legal status. In 2009, he was issued with a deportation order. Ohio Congressman Tim Ryan describes Adi as a "pillar" of their community, who creates jobs with his multiple businesses and distributes hundreds of turkeys to the poor on Thanksgiving. For years, the House Democrat has been fighting for Adi to remain in America and it was his efforts that secured consecutive stays of the deportation order. "If you would see the breadth of support that this gentleman has, from whether it's his Italian-Irish Catholic congressman or an African-American Pentecostal Republican woman who is supporting him or the working-class people I saw in his shop the day they thought he was going to get deported ... to show support for him," Ryan told CNN in an interview. Among Adi's businesses are a hooka bar, a convenience store and a deli. "He has a Jewish attorney whose father survived the Holocaust ... this person has brought this community together in Youngstown, Ohio," Ryan added. While Adi's deportation order was issued in 2009, ICE did not proceed with the deportation. He was, instead, required to routinely check in with the agency, which he was diligent about, according to his lawyer David Leopold. In 2013, Ryan presented a private bill -- legislation specific to a person and not affecting overall policy -- to Congress, which would get him a more thorough review of his case. He has presented the bill several times since then. Having the private bill in motion meant Adi was granted a two-year stay. Under Trump, though, ICE reduced the deportation stay to six months, according to Ryan. Last September, an ICE field office put an ankle bracelet with a GPS monitor on Adi. He was then told to make arrangements to leave the US, according to his lawyer. In a statement to CNN, ICE said that he would be allowed to return only if the bill is finally passed. "While ICE acknowledges Congress's authority to pass legislation providing immigration benefits to non-citizens, alien beneficiaries need not be present in the United States for a private immigration relief bill to be introduced, considered and/or enacted. An alien who is granted relief through the enactment of a private immigration bill can lawfully travel back to the United States," the statement read. After conducting a comprehensive review of Adi's case, ICE said in the statement that it has chosen not to grant a stay of removal. Over the past decade, Adi's immigration case has "undergone exhaustive judicial review at multiple levels of the nation's courts, including before the immigration courts, federal appeals courts and U.S. district court. In each review, the courts have held that Adi does not have a legal basis to remain in the US," ICE said in the statement. Adi's last few months were a rollercoaster of emotions, expecting deportation amid the ramped-up crackdown on illegal immigration across the US as part of the Trump administration's stance on the issue. Adi and his second wife Fidaa, a US citizen, arranged to leave the United States at their own expense in early January. They sold the family home and prepared to say goodbye to everyone. "ICE agents were to meet them at the airport and remove his ankle bracelet before he boarded the flight," Adi's attorney told CNN. "On January 4th, ICE called to say that they canceled the departure date -- that he should not depart as scheduled and that no new date was set." But according to Leopold, Adi was asked instead to report to ICE local headquarters on January 15 for a routine check-in to discuss the case. Adi was escorted by several supporters including Ryan, but he was taken into custody without being given a reason. Adi was not able to see his family before being put on a plane to Amman on January 30. Over the past year tens of thousands have been arrested by ICE, according to Human Rights Watch. Many, like Adi, are deeply rooted in their communities and have no criminal convictions. More undocumented immigrants have been arrested under the Trump administration, while deportations have lagged behind the rates of the Obama administration. Last year, ICE's deputy Director Thomas D. Homan said that under Trump's administration, undocumented immigrants "should be afraid," explaining that anyone who has violated the law should be looking over their shoulder. ICE has made clear that while they still prioritize criminals, they also prioritize undocumented immigrants with final deportation orders and do not consider anyone exempt from being arrested or put into deportation proceedings. "I don't think there is any question that this is the new normal ... To watch these families get ripped apart is the most heart-breaking thing any American citizen could ever see ... Because you are for these families, it doesn't mean you are not for a secure border," said Ryan. "I am for a humane pathway for good people who want to participate in the American dream and who have contributed to this country for 40 years and are an American in every sense of the word," he said. A day after arriving in Amman, a city he barely recognizes now, Adi was still in shock and disbelief. "The American dream started 40 years ago for me ... I built this whole thing scratch from nothing. Even if anybody wants to stop that American dream, I won't let them. I'm going to keep the fight going," an emotional Adi told CNN. The hardest thing, he said, is being away from his family. "I miss my wife, the kids," he said, choking back tears. "I miss Youngstown. I miss everybody."